Although fire ecology is not so popular in Japan, wildfire is common with global scale. In fact, various plant taxa and communities have evolved fire-adapted life histories. For examples, smoke-induced seed germination is remarkable in South Africa and Australia where woodland fire is common, and serotinous trees, e.g., Picea mariana, establish in Alaska and California. While, the development patterns of such plant communities affect the intensity and frequency of fire, and such interactions between plants and environments are recognized. Here, we call 'fire ecology' a whole aspect of fire-related ecology. 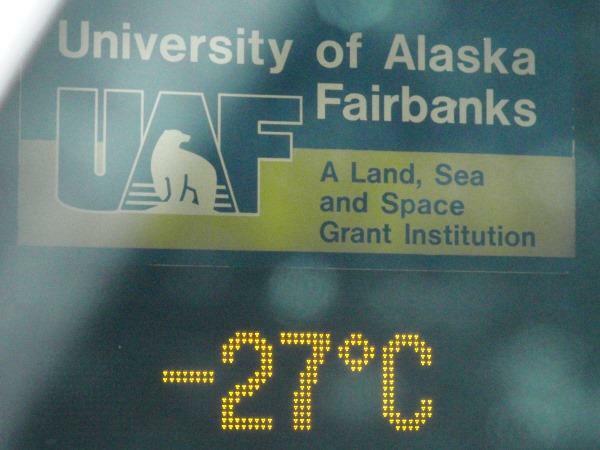 Global warming will change the characteristics of fire, represented by its scale, intensity and frequency, via changes in precipitation and the other climatic factors. 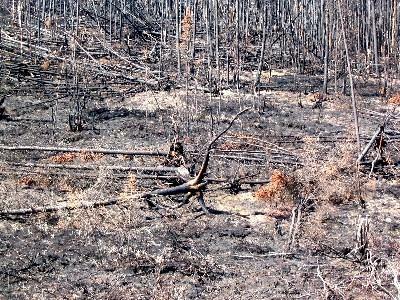 Furthermore, the function of forests will change from carbon sink to carbon source, due to increase in number of fires. Those predictions suggest that fire ecology is one of the important research themes on global warming. spot is seen on the right side. 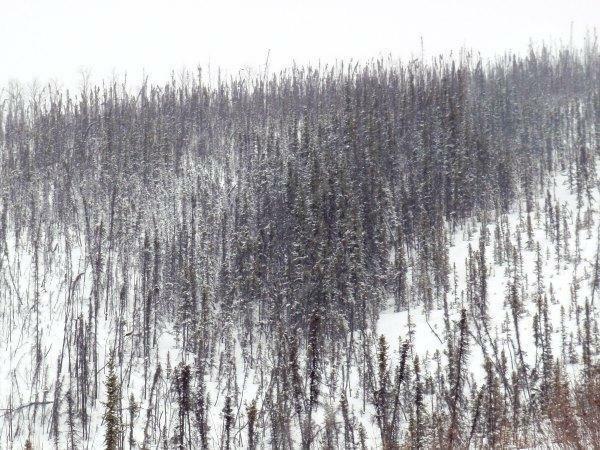 We started the monitoring of Picea marinana forest recovery after large-scaled forest fire occurred in 2004 at the north-facing slope of Poker Flat near Fairbanks, Alaska. The titles are indicated in the Japanese page. 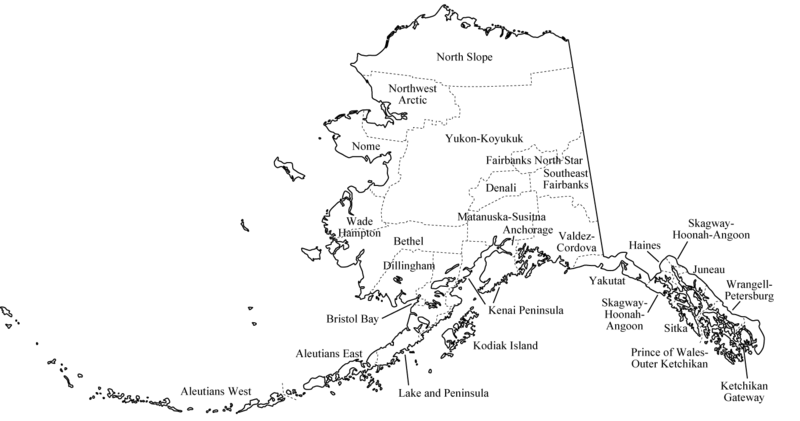 A huge wildfire, of which nickname is the Boundary Fire, stroke the northern areas of Fairbanks, including the Poker Flat Research Range (PFRR), in the summer of 2004. The characteristics of this wildfire were expressed by severity and scale, i.e., the surface soil layer was removed completely in large areas (Fig. 1). While, un-burnt Sphagnum (peat moss) mat generally provides safe site for the seedling emergence of Picea mariana (black spruce) when wildfire occurs as 'crown fire'. On PFRR, therefore, we have annually monitored the revegetation patterns from 2005 to the present, with special reference to the emergence, survival, and growth of P. mariana seedlings on severely-burnt sites. We set up six 1 m × 1 m quadrats within each of 16 10 m × 10 plots, and marked all seedlings emerged in the quadrats at every census. In the 16 plots, 402 stems higher than diameter at breast height (1.3 m), most of which were P. mariana, were recorded. At the first census in the spring of 2005, 313 stems had been dead, due mostly by the wildfire (Fig. 1). To compare differences between burnt and un-burnt surfaces, we set up plots with various-severities of wildfire. Burnt area became 66.2% in the 96 quadrats. Betula papyrifera). Of 834 P. mariana seedlings, 670 seedlings, which accounted for 80% of P. mariana seedlings, established on un-burnt surfaced. The seedling density was 20.6/m² on un-burnt surface and 2.6/m² on burnt surface, indicating that P. mariana seedling establishment decreased when the ground surface was burnt. The establishment of deciduous trees was outstanding on burnt surface, i.e., all deciduous tree seedlings established on burned surface, except three B. papyrifera seedlings on un-burnt surface. This also meant that the removal of ground surface is prerequisite for the establishment of deciduous trees. For P. mariana seedlings emerged in 2005, seedling mortality was higher on un-burnt surface, due mostly to shading and burial by Sphagnum. The survival of deciduous trees was more than 50% by 2008. Therefore, Sphagnum mat has two roles: 1) restricting the establishment of deciduous trees, and 2) providing safe sites for P. mariana seedling emergence, although the mortality was higher (Tsuyuzaki et al. 2014). Stem growths expressed by stem height and crown area were significantly higher on deciduous trees than on P. mariana (Fig. 2). The stem growth of P. mariana was significantly slower on un-brunt surface than on burnt surface. Therefore, burnt surface was more preferable for the growth of all trees. To detect the resource allocation patterns on tree seedlings, 84 seedlings were harvested, separated into growth organs (leaf, stem, and root), and weighed after drying up at 80°C for 3 days. The allometry differed between species on burnt surface (ANCOVA, P < 0.05). In particular, the aboveground biomass of deciduous trees allocated more to height growth than the biomass of P. mariana, indicating that deciduous trees acquired light more effectively than P. mariana. While, P. mariana showed low allocation plasticity between burnt and un-burnt surfaces. Therefore, on burnt surface P. mariana seemed not to grow up well, due to the competition by deciduous trees. In conclusion, the establishment of deciduous trees proceeded if the ground surface was burned completely. P. mariana is unlikely to recover promptly by seedling regeneration when the ground surface is burnt out. 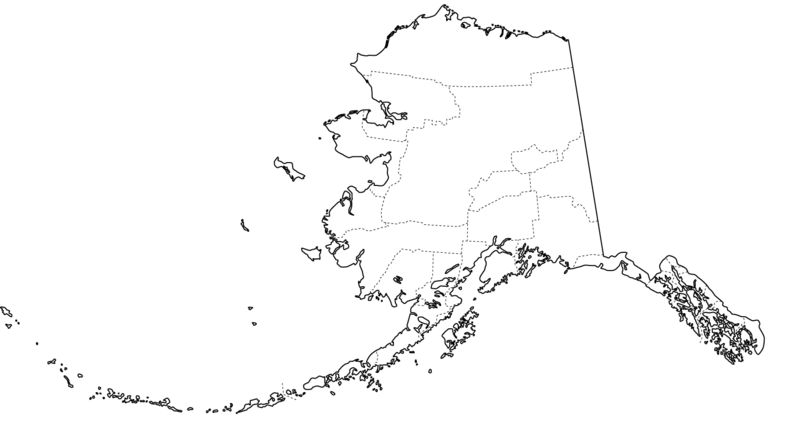 The keystone taxa in Alaskan P. mariana forest are considered to be Sphagnum spp. We have a plan to detect the determinants on Sphagnum recovery to maintain the regeneration of P. mariana after severe wildfires. 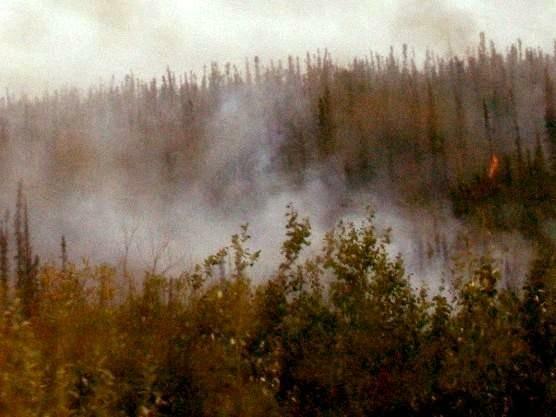 Tundra fires are increasing in their frequencies and intensities due to global warming, which alter revegetation patterns through various pathways. 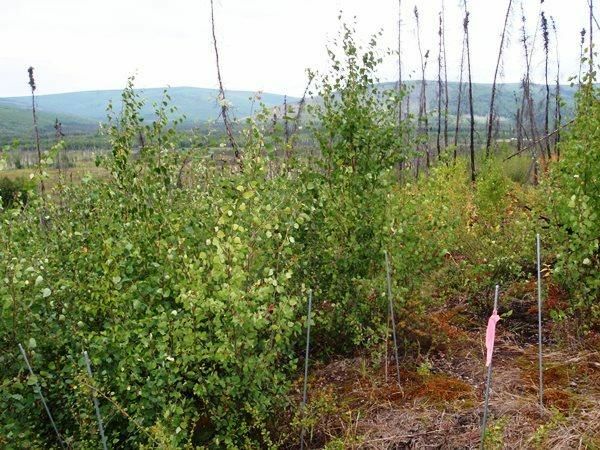 To understand the effects of tundra fire and the resultant thermokarst on revegetation, vegetation and related environmental factors were compared between burned and unburned areas of Seward Peninsula, Alaska, using a total of 140 plots, 50 cm ×50 cm each. The area was burned in 2002 and surveyed in 2013. Seven vegetation types were classified by a cluster analysis and were categorized along a fire-severity gradient from none to severe fire intensity. The species richness and diversity were higher in intermediately disturbed plots. Severe fire allowed the immigration of fire-favored species (e.g., Epilobium angustifolium, Ceratodon purpureus) and decreased or did not change the species diversity, indicating that species replacement occurred within the severely burned site. Although thermokarsts (ground subsidence) broadly occurred on burned sites, due to thawing, the subsidence weakly influenced vegetation patterns. These results suggest that the fire directly altered the species composition at a landscape scale between the burned and unburned sites and it indirectly altered the plant cover and diversity through the differential modification, such as thermokarst, at a small scale within the burned site. Kimura, H. & Tsuyuzaki, S. 2011. Fire severity affects vegetation and seed bank in a wetland. Applied Vegetation Science 14: 350-357. Tsuyuzaki, S., Kushida, K. & Kodama, Y. 2009. 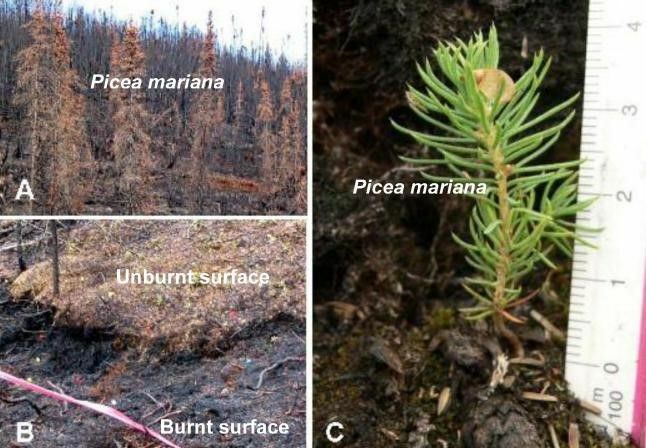 Recovery of surface albedo and plant cover after wildfire in a Picea mariana forest in interior Alaska. Climatic Change 93: 517-525.